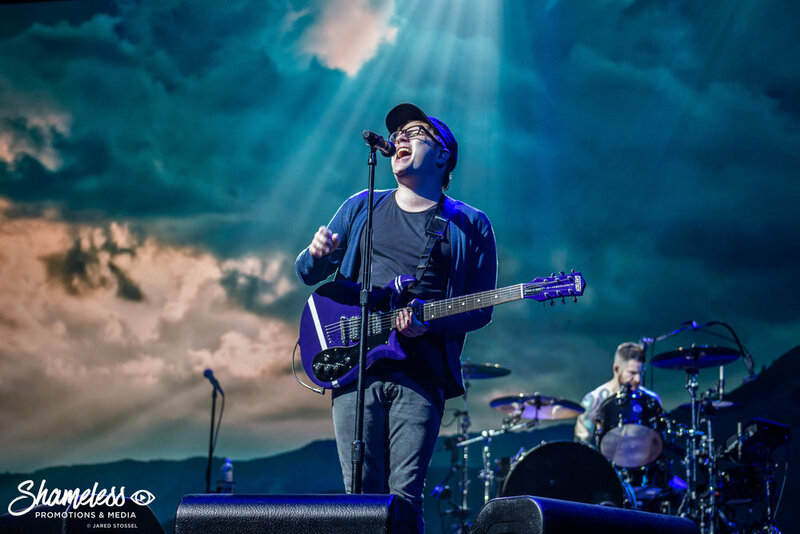 Patrick Stump and Andy Hurley of Fall Out Boy performing at SAP Center in San Jose, CA on September 30, 2018. Photo Credit: Jared Stossel. 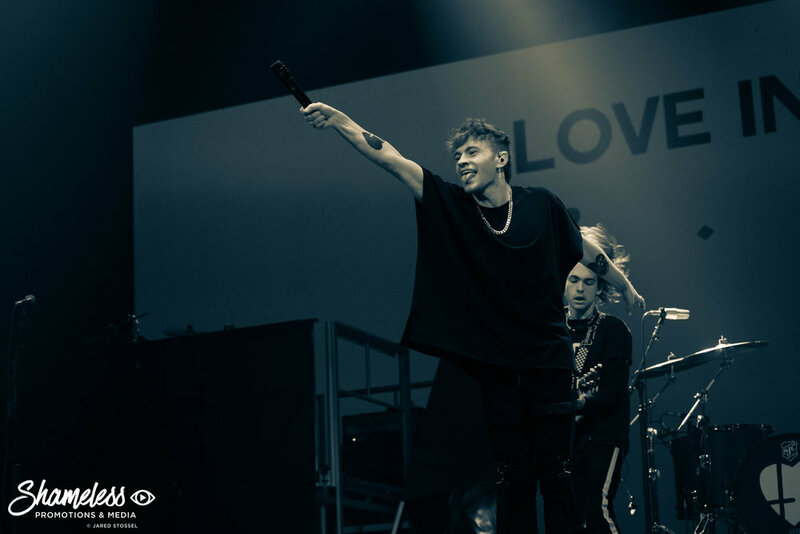 w/ Machine Gun Kelly, L.I.F.T. 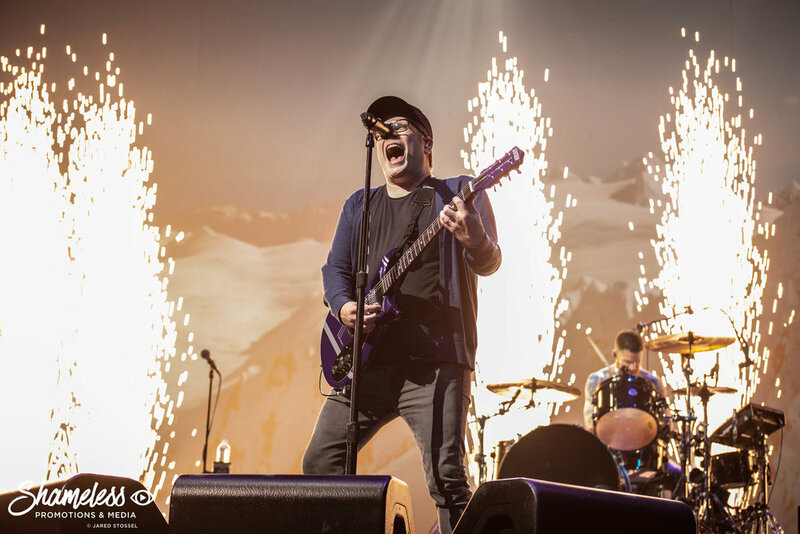 Fall Out Boy have been on the road heavily supporting MANIA, their seventh studio album for close to two years now. 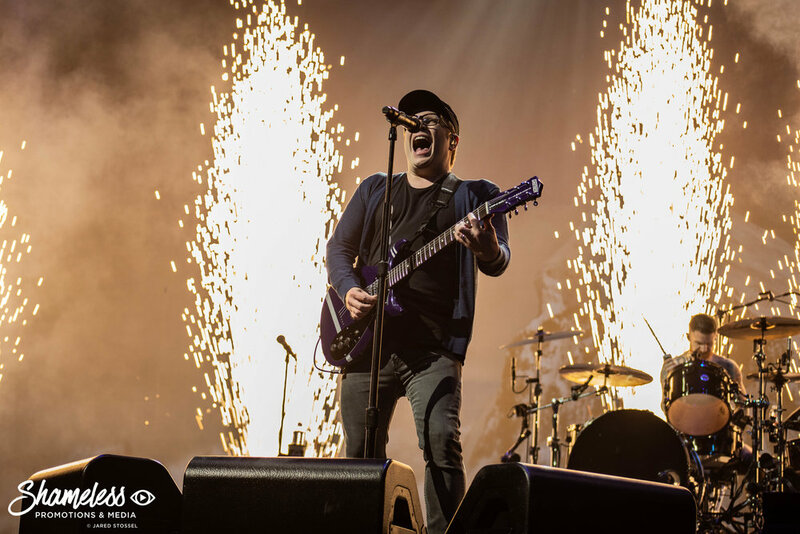 The album was originally set to release in 2017, but vocalist Patrick Stump announced they’d be pushing the release to January 2018 due to it feeling too rushed, although touring still continued in support of the record, as originally scheduled. 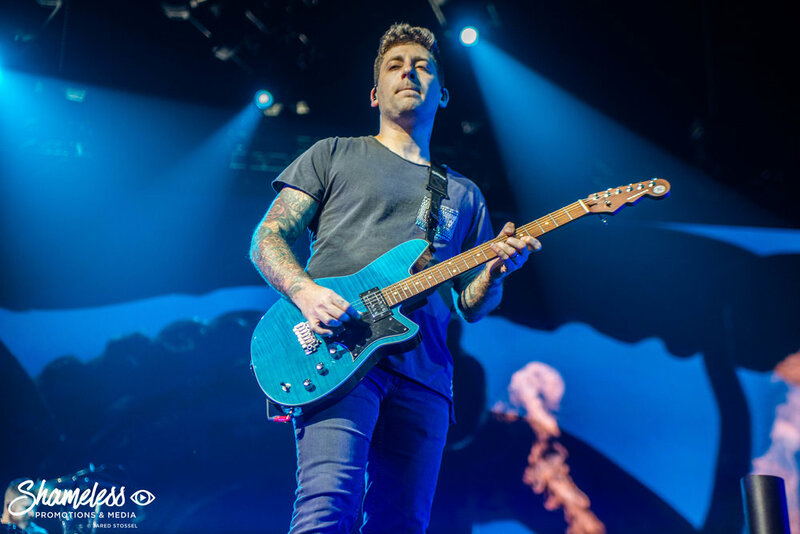 On October 10th, the band will be concluding their run of the MANIA Tour, but they made a stop in the Bay Area on the concluding leg, this time at San Jose’s SAP Center (last year, the band performed at Oracle Arena). With just a couple songs switched up from the set list they performed last year, Fall Out Boy (comprised of vocalist/guitarist Patrick Stump, bassist Pete Wentz, guitarist Joe Trohman, and drummer Andy Hurley) brought forth a live show that is quite possibly the best I’ve heard them play in years. While it is weird seeing them play such larger venues now when I was accustomed to seeing them perform in theaters and “small arenas” (such as the SJSU Event Center in San Jose), it’s amazing to see how much their career and songwriting skills progress with each album cycle. 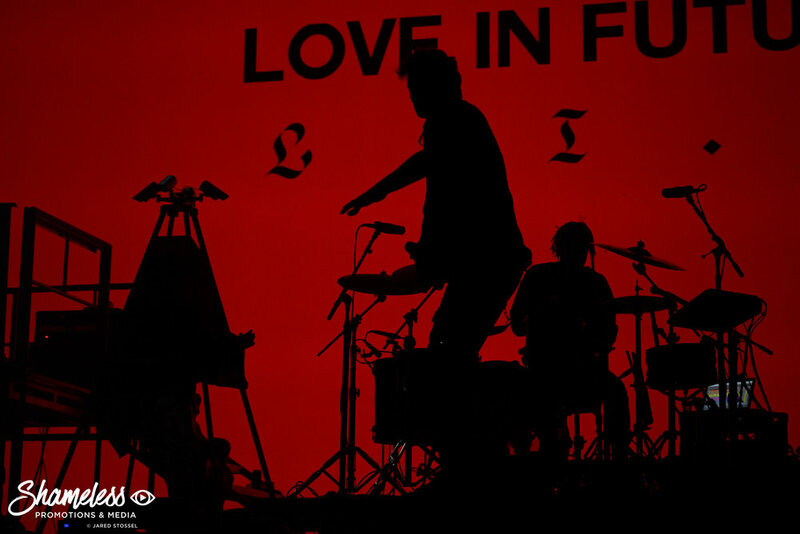 The show was opened by an up-and-coming rock-rap hybrid band named L.I.F.T. (Love In Future Times). They’re a newer act that’s been signed to bassist Wentz’ DCD2 label, and they’re beginning to make a name for themselves. 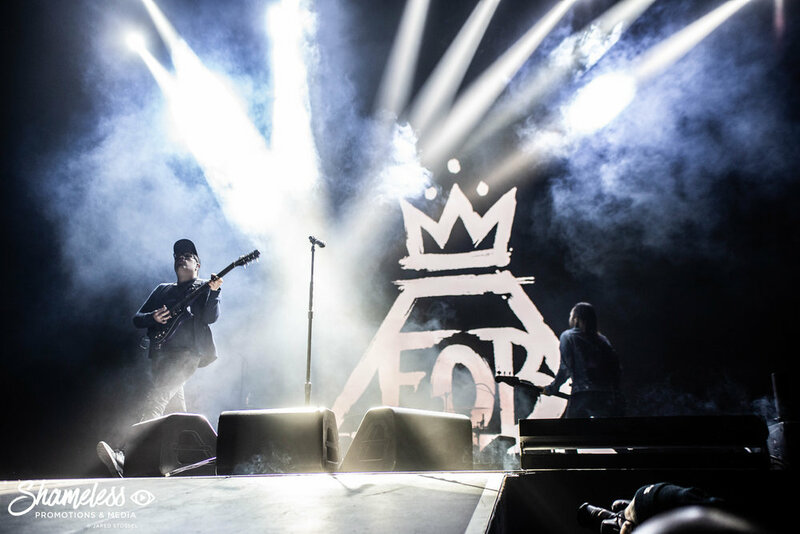 No matter how many heads they may turn with tour announcements, Fall Out Boy have always been blessed with the ability to pick the perfect lineup, from openers to main support. It’s quite a common act for Wentz to bring out bands on his own label as support for Fall Out Boy tours, and it works well. 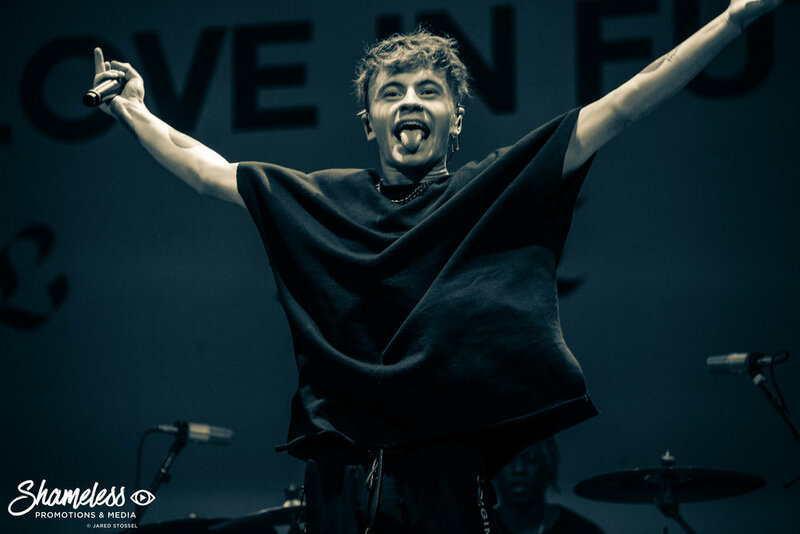 L.I.F.T. are just starting out (they just released their debut EP, AUTOP$Y), this summer), and they have great potential to make a name for themselves within this music scene. 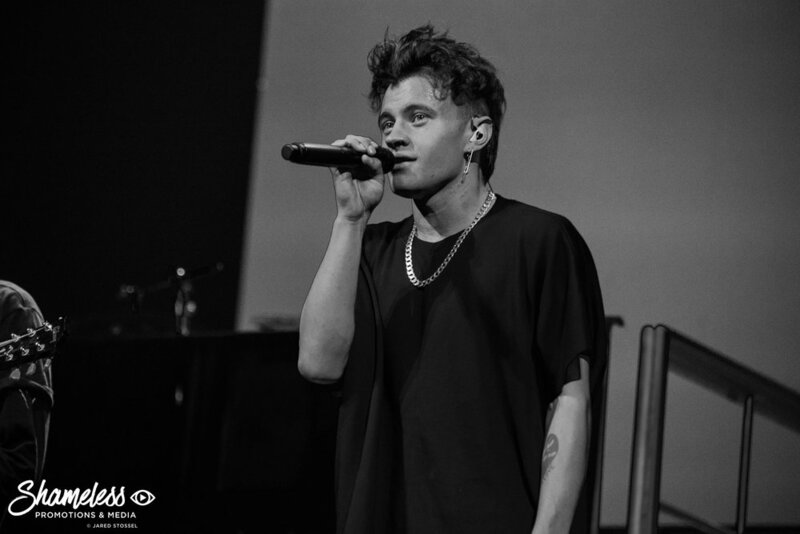 They’ve got the stage presence and sound nailed down; all it take is perfecting that sound on the road. 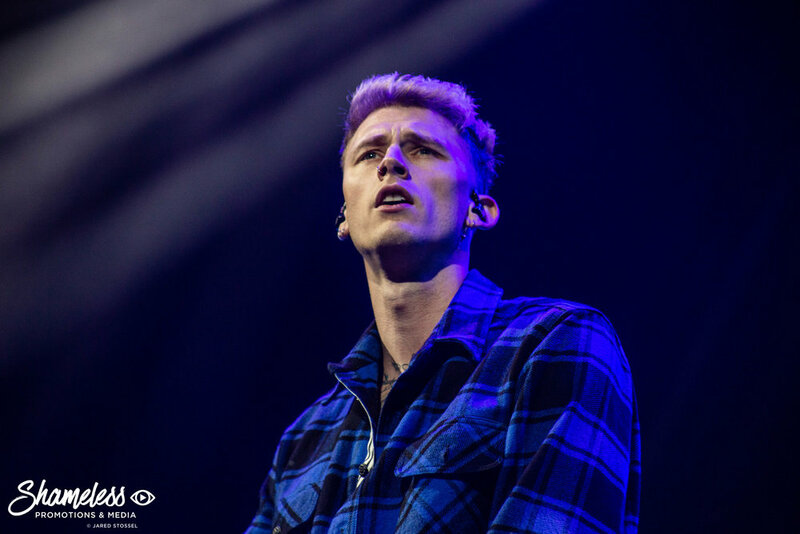 Perhaps one of the biggest head-scratching moments for fans was the announcement of rapper Machine Gun Kelly as the main support act for this leg of the tour. Kelly (real name Colson Baker) has been in the media lately for famously pitching a rap feud with Eminem. Regardless of what you think of his music, you have to admit that this guy has balls going up against one of the biggest names in rap, someone who has been known to take down numerous peoples’ career trajectory with a single diss track. His confidence exudes throughout the show, but not in an annoying manner. Not in a way that makes you cringe the way a lot of modern “mumble-rappers” exude confidence nowadays. 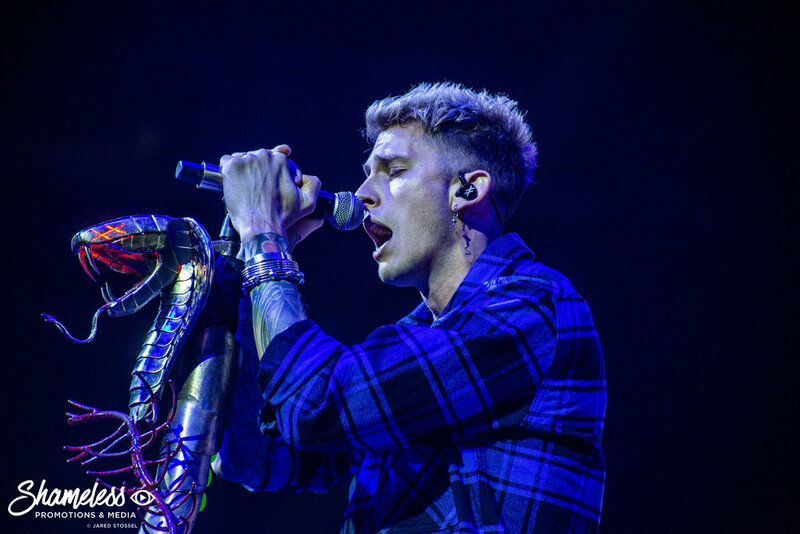 MGK’s set surprised me a great deal, as he showcased to a packed arena how impressive of a show he can put on. 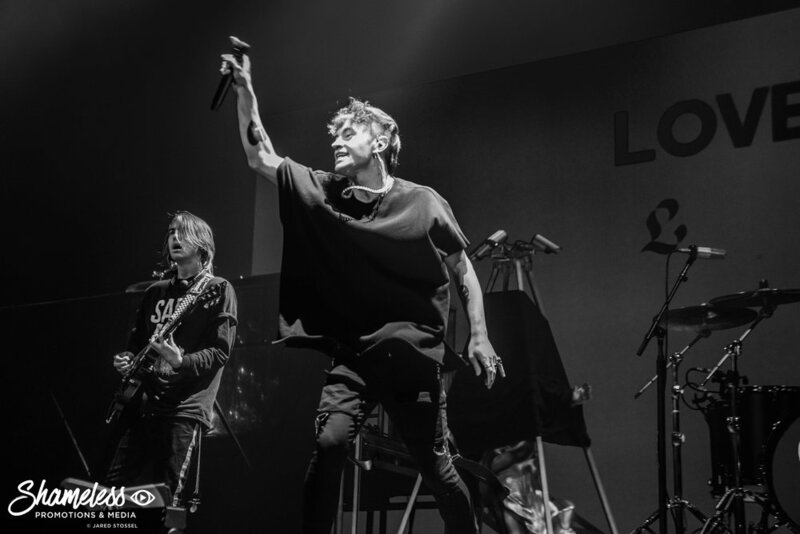 Supported by a full live band rather than backing tracks, Machine Gun Kelly brought forth a highly memorable opening set, which has only made me more curious as to what he can do on a headlining run. Fall Out Boy rose up from the stage and surprised an entire crowd by opening with “Disloyal Order of Water Buffaloes”, a track from cult-fan-favorite album Folie a Deux, a track that I would consider to be one of their best songs from their catalogue. Fire adorned every corner of the stage as they powered headfirst into “The Phoenix” (from Save Rock and Roll), while sparklers shot up from the stage during “Irresistible (from American Beauty/American Psycho). Pyrotechnics and special effects were heavily used throughout the show (sometimes, a little too much). 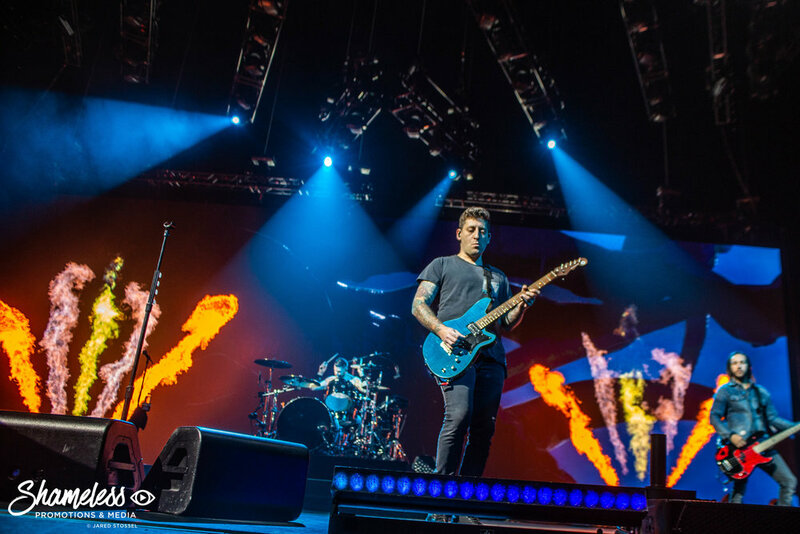 Even with moments where it didn’t necessarily work, many more moments paid off, such as the flamethrower attached to Wentz’ bass during a number of songs, or the sparkler cascade that covered the entire ramp and stage during the end of “Save Rock And Roll”. About halfway through the show, the band retreated off stage with only vocalist Stump remaining on stage, behind a piano, playing a powerful rendition of “Young And Menace”, the first single off of MANIA. 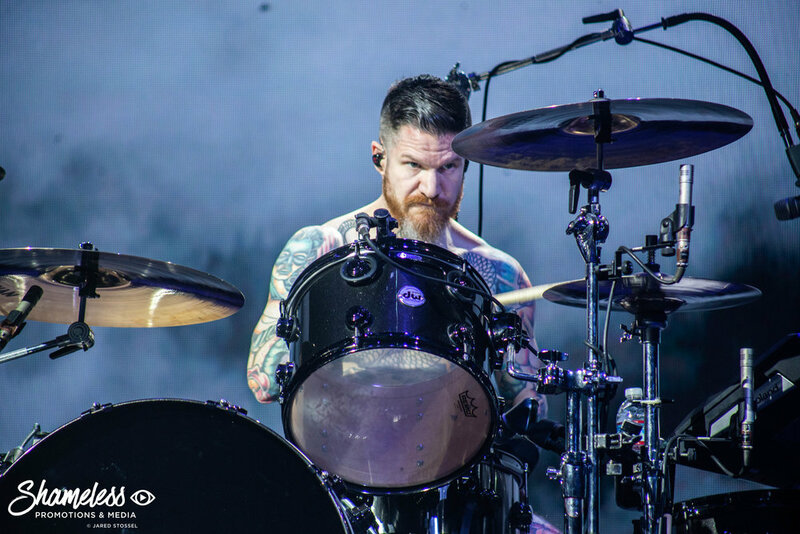 At the other end of the arena, drummer Andy Hurley rose up above the crowd on a large riser, playing a drum solo that coursed through hip-hop, electro, and even death metal (shoutout to Hurley for dropping in a Cannibal Corpse track). 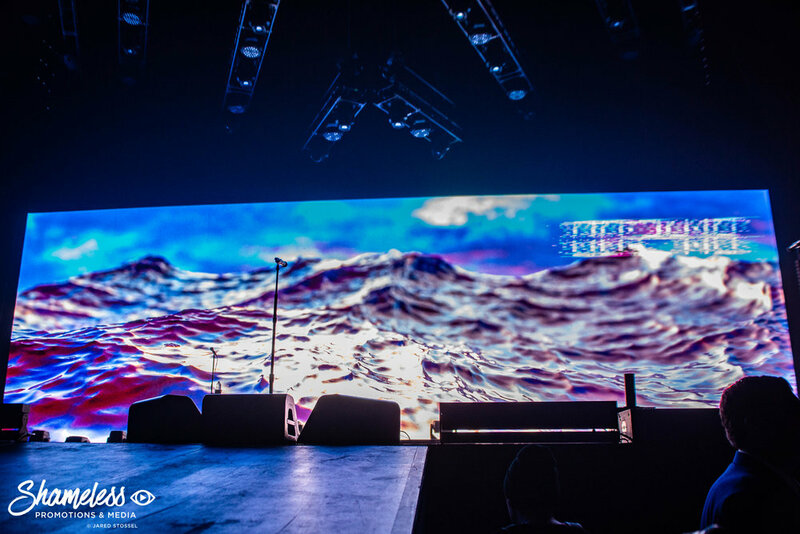 Two makeshift stages rose up to the nosebleed seats where all four members performed tracks like “Dance Dance”, “Wilson (Expensive Mistakes)” and “Thnks Fr Th Mmrs” to those in the back of the arena. After a brief interlude that featured the iconic llama mascots that have been present in the band’s marketing for MANIA, they returned to the stage for the middle-finger anthem “I Don’t Care”, “This Ain’t A Scene, It’s An Arms Race”, and even a performance of “Lake Effect Kid” a new track that was released shortly before the band headlined Wrigley Field in Chicago for their massive homecoming show. Old school fans were delighted when the opening lines to “Grand Theft Autumn/Where Is Your Boy” were sung towards the end of the evening, which was then followed up with “Centuries”, and a fire-filled encore performance of “My Songs Know What You Did In The Dark”. In traditional Fall Out Boy fashion, the band closed with “Saturday”, an iconic track from their debut album Take This To Your Grave. The finale features Wentz diving into the barricade and high-fiving fans while confetti streams down over the entire arena. Whether you’re reading this as a fan or someone who detests them, there is no getting around that seeing Fall Out Boy in a live setting is an experience, and it’s one that I’ve seen turn some of the biggest naysayers into some of their biggest supporters. 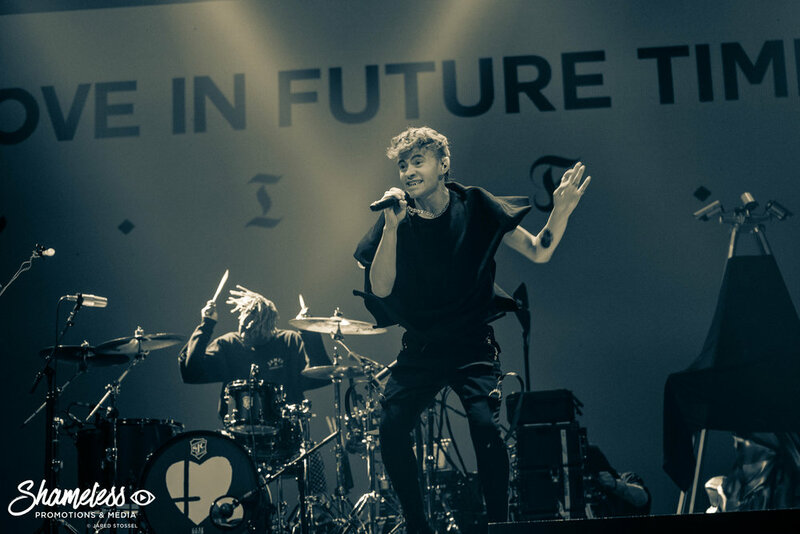 They’re a live show that you need to witness at least once. 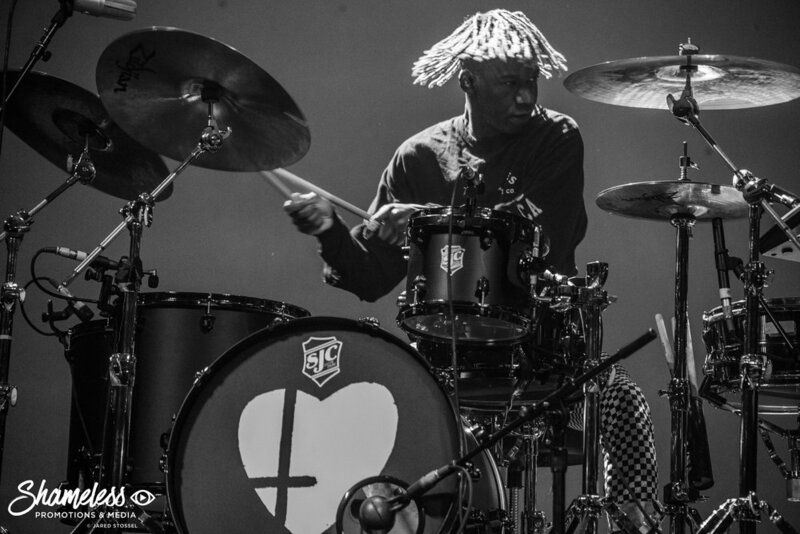 If you have the opportunity, head out to one of the last dates of the MANIA tour and see why they’re still considered the reigning champions of the alternative music scene.